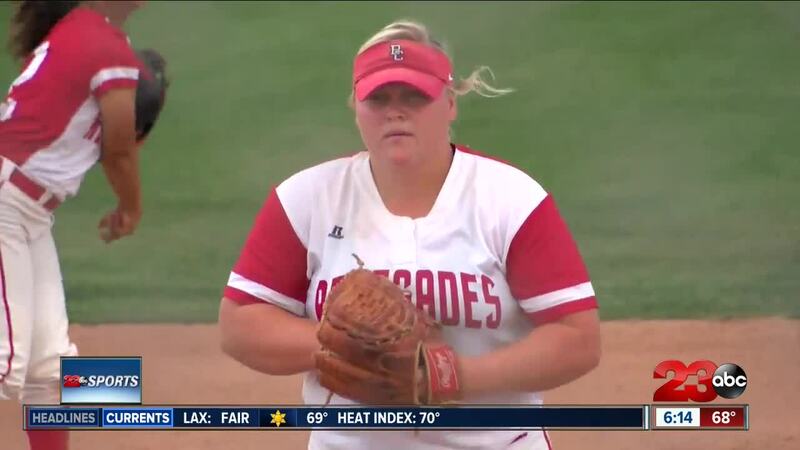 BAKERSFIELD, Calif. — Pitcher for the Renegades softball team, Kylee Fahy, led the state last year in strikeouts and currently leads in that category this season. When she steps on the field, anyone can tell right away she's a competitor, but besides a scar on her stomach, no one would ever know that she's been a fighter her whole. "It’s just hard to think that I wasn’t supposed to play sports because that’s all I've known my whole life is softball, softball is my life," Kylee Fahy said. Kylee was born six weeks early and with a diaphragmatic hernia, leaving a hole in her lungs and her father remembers every detail from diagnosis to surgery. “Everyone said it was a very serious condition, very rare and it’s like a 99 percent fatality rate," Scott Fahy said. And if she were to survive to the birth defect, she likely wouldn’t be able to play sports. She did both. “God definitely came down and put a hand on her," Scott said. "And looked over her for sure." One of the many doctors the Fahy family has to thank for having a hand in that miracle is Dr. Sudhir Patel. “We see some of the children come back to our clinic for about three years but then we don’t see them afterwards, except occasionally we bump into them in town, you’d be surprised how often that happens. But it’s always a lot of fun to see the patients again after so many years," Patel said. The two reunited for the first time this month since Kylee left the hospital. “I wasn’t supposed to survive so being able to meet someone that played a part in basically saving me was very cool," Kylee said. She has been surprising people throughout her whole life. “I would never have predicted that she would have enough lung capacity to compete at this level," Patel said. But it's easy for Kylee because she's not thinking of any of it. “I step on this field and i forget everything, this is my safe haven," Kylee said. And after a record year at Bakersfield College, leading the state in total strikeouts 289 and this season she currently leads with 223 through 25 games started. “I didn’t realize how good i was going to do last year, so this year my expectations are to do as good or even better than I did last year. And last year I fell in love with the sport again," Kylee said. Another second chance for this athlete. “You can't take things for granted, you have to live your life and whatever happens, happens," Kylee said.